The Micro OWL 2 / Laser OWL Test Kit contains the tools necessary for certifying singlemode fiber optic networks against a myriad of popular cabling standards, including two user customizable standards. The Laser OWL is a NIST traceable singlemode light source. Its dual wavelength outputs (1310nm / 1550nm) are temperature stabilized for accurate measurements. Three connector options are available (ST, SC, and FC). 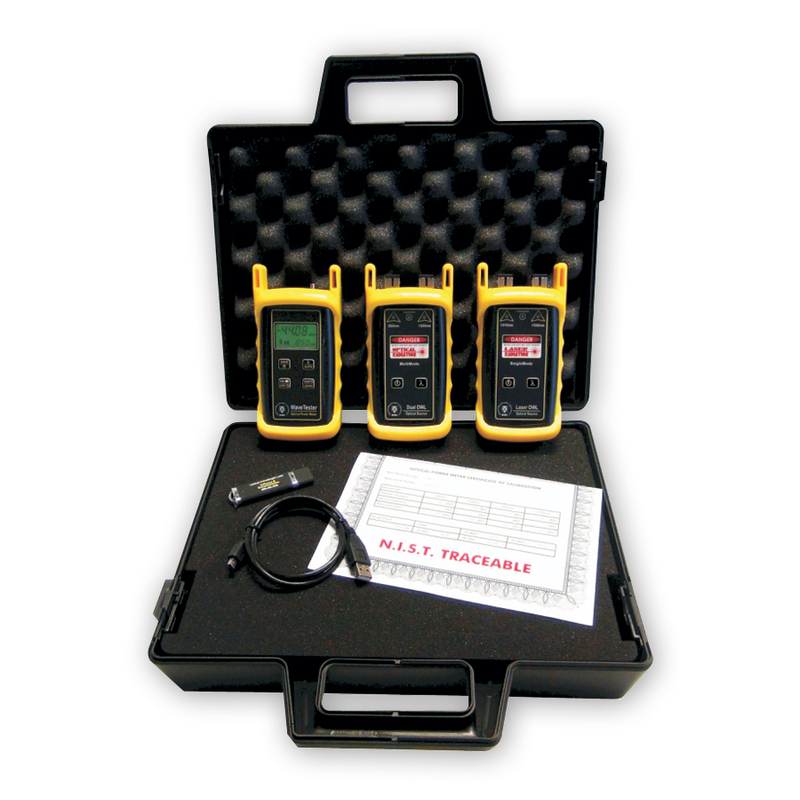 The WaveTester / WaveSource Quad Test Kit contains the tools necessary for certifying fiber optic links against a myriad of popular cabling standards in multimode and singlemode networks. 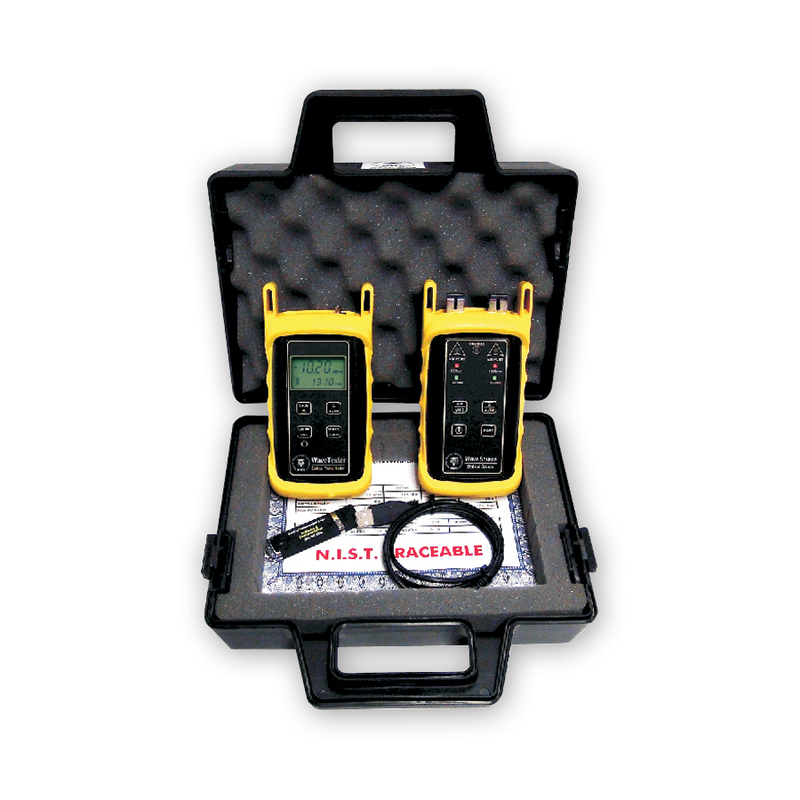 The WaveTester optical power meter is multimode and singlemode ready, and can store reference values for all wavelengths used for optical loss measurements. Up to 200 fiber runs may be stored, and serially downloaded to a PC for report generation using our OWL Reporter software. The WaveSource Quad is a combined multimode / singlemode light source. Its quad-wavelength outputs (850 & 1300nm for multimode and 1310 & 1550 nm for singlemode) are temperature-stabilized for accurate measurements. Three connector options are available (ST, SC, or FC). The WaveTester / WaveSource 850/1300 Test Kit contains the tools necessary for certifying fiber optic links against a myriad of popular cabling standards in multimode networks. 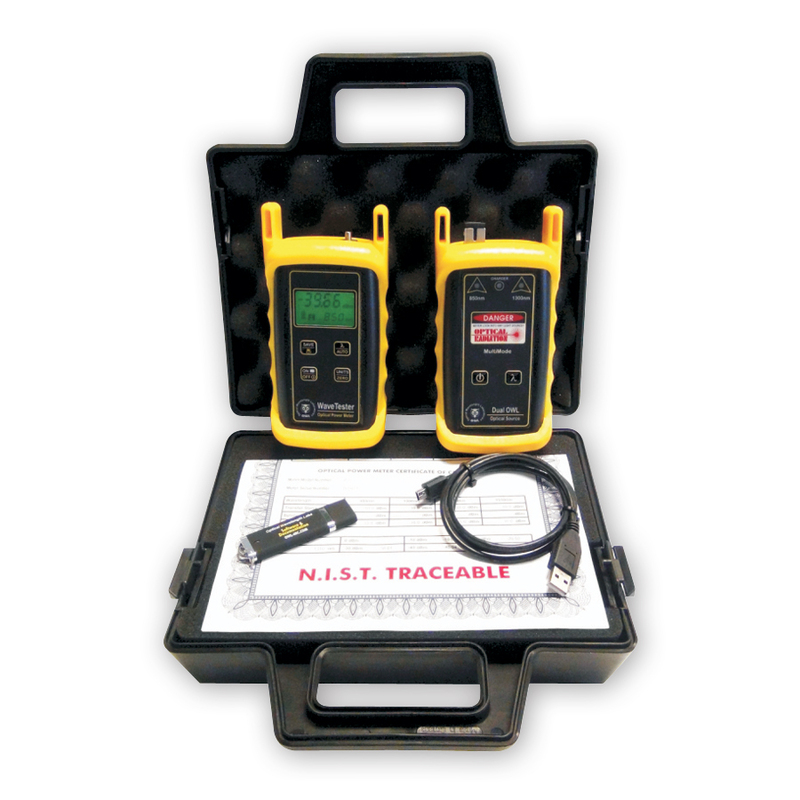 The WaveTester optical power meter is multimode and singlemode ready, and can store reference values for all wavelengths used for optical loss measurements. Up to 200 fiber runs may be stored, and downloaded via a PC serial port for report generation using our OWL Reporter software. The WaveSource 850/1300 is a multimode light source. Its dual wavelength outputs (850 nm & 1300 nm) are temperature-stabilized for accurate measurements. Two connector options are available (ST or SC). The WaveTester / WaveSource 850/1300/VFL Test Kit contains the tools necessary for certifying fiber optic links against a myriad of popular cabling standards in multimode networks. The WaveSource 850/1300/VFL is a multimode light source. Its dual wavelength outputs (850 nm & 1300 nm) are temperature stabilized for accurate measurements. A Visual Fault Locator is also included for near-end visual fault location and visual fiber identification. Two connector options are available (ST or SC). The WaveTester / WaveSource 1310/1550 Test Kit contains the tools necessary for certifying fiber optic links against a myriad of popular cabling standards in singlemode networks. The WaveSource 1310/1550 singlemode light source has dual wavelength outputs (1310 nm & 1550 nm) that are temperature stabilized for accurate measurements. Two connector options are available (ST or SC). The WaveTester / WaveSource 1310/1550/VFL Test Kit contains the tools necessary for certifying fiber optic links against a myriad of popular cabling standards in singlemode networks. The WaveSource 1310/1550/VFL singlemode light source has dual wavelength outputs (1310 nm & 1550 nm) that are temperature stabilized for accurate measurements. A Visual Fault Locator is also included for near-end visual fault location and visual fiber identification. Two connector options are available (ST or SC). The WaveTester / Dual OWL / Laser OWL Test Kit contains the tools necessary for certifying fiber optic links against a myriad of popular cabling standards in multimode networks at 850 nm and 1300 nm, and singlemode networks at 1310 nm and 1550 nm. The Dual OWL is a multimode light source. Its output is temperature stabilized for accurate measurements. Two connector options are available (ST and SC). The Laser OWL is a singlemode light source. Its output is temperature-stabilized for accurate measurements. Two connector options are available (ST and SC). Conforms to the Harmonized European Standards EN 61326-1 & EN 61010-1. The WaveTester / Dual OWL 850 / Laser OWL 1310 Test Kit contains the tools necessary for certifying fiber optic links against a myriad of popular cabling standards in multimode networks at 850 nm and singlemode networks at 1310 nm. The Dual OWL 850 is an 850nm multimode light source. Its output is temperature-stabilized for accurate measurements. Two connector options are available (ST and SC). The Laser OWL 1310 is a 1310nm singlemode light source. Its output is temperature-stabilized for accurate measurements. Two connector options are available (ST and SC). The WaveTester / Dual OWL 850 Test Kit contains the tools necessary for certifying fiber optic links against a myriad of popular cabling standards in multimode networks at 850nm. The Dual OWL 850 is a multimode light source. Its output is temperature-stabilized for accurate measurements. Two connector options are available (ST and SC). The WaveTester / Dual OWL Test Kit contains the tools necessary for certifying fiber optic links against a myriad of popular cabling standards in multimode networks at 850 and 1300nm. Also as an option, a visual fault locator (VFL) port can be installed in place of the charger port for an additional charge. The Dual OWL is a multimode light source. Its output is temperature stabilized for accurate measurements. Two connector options are available (ST and SC). The WaveTester / Laser OWL Test Kit contains the tools necessary for certifying fiber optic links against a myriad of popular cabling standards in singlemode networks at 1310 and 1550nm. The Silicon ZOOM II (Zeroed Output Optical Meter) is an economical fiber optic power meter designed to provide accurate testing of multimode fiber cables at 850nm wavelength. The 4-digit 7-segment LCD display shows power readings with a resolution of 0.01dB, power units in dBm, dB, or uW, and battery power level. The Silicon ZOOM II comes configured with a 2.5mm universal port for connection to SC, ST, and other connector types that have a 2.5mm ferrule. The Dual OWL 850 is an 850nm NIST traceable multimode light source. Its 850nm output is temperature-stabilized for accurate measurements. The Dual OWL 850 has two connector options: ST or SC.